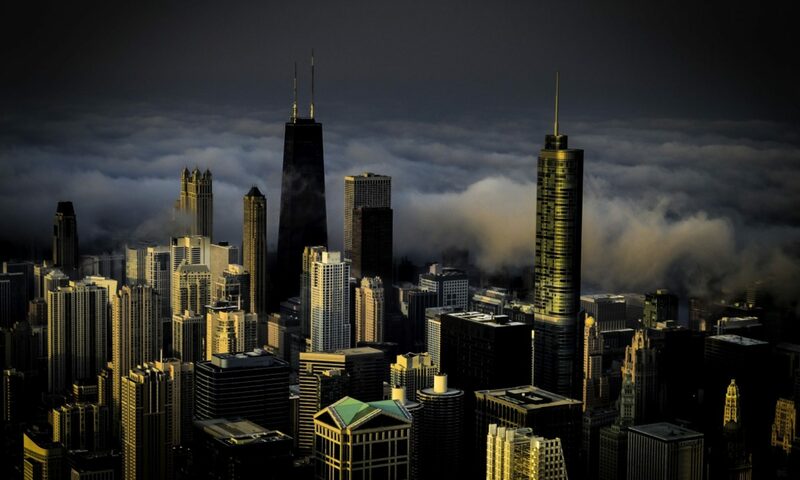 There are at least three parts to every kingdom: the government, the nation, and the country. The government is the king and his agents, the nation is the people under the king’s authority, and the country is the physical land under the king’s control. Yeshua often spoke of the Kingdom of Heaven in seemingly contradictory ways: the Kingdom existed before he came, he brought the Kingdom with him, and the Kingdom was still to come. Can all of these be true or was Yeshua just talking in riddles? The answer is “Yes!” All of these are true, and Yeshua was speaking in riddles. 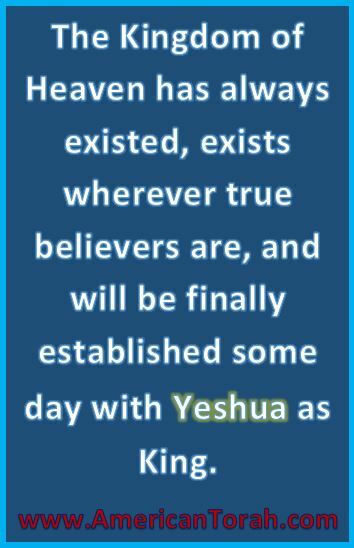 The Kingdom of Heaven has always existed, exists wherever true believers are, and will be finally established some day with Yeshua as King. The key to understanding the New Testament references to the Kingdom of Heaven (or Kingdom of God) is to understand the three parts of a kingdom and how they can sometimes exist independently of each other. The first dominion of Heaven is the nation of Israel. I don’t mean the secular State of Israel, which is another government altogether. Firstly, the nation is made up of a remnant of physical Israel, genetic descendants of the twelve sons of Jacob.5 Secondly, the nation is made up of the mixed multitude of believers who have been grafted into the tree of natural Israel.6 So everyone who calls on the name of God and believes on the name of Yeshua7 is a citizen of the nation of Israel regardless of where or when they live. The second dominion of Heaven is the country, both here on Earth and in Heaven itself. It includes the Promised Land in the Messianic Era, which Yeshua will rule from Jerusalem,8 as well as the Heavens in which the angels live and which Yeshua rules from the Crystal Sea.9 Anyone who is a citizen of those lands is also a citizen of Israel under the authority of Yeshua. The practical outgrowth of citizenship in the true nation of Israel is both responsibility and reward: obedience to the king’s laws10 and healing from the curses of disobedience. Fortunately, his yoke is easy, his burden is light,11 and his rewards are beyond your imagination.12 The only things you have to lose by submitting to his rule are not worth keeping. 2 John 1:49, John 12:12, & Acts 2:36. 3 The qualities that God seems to hold highest are selflessness, mercy, justice, and generosity. 4 Matthew 11:11-13, 13:44-46, 16:17-19, 20:20-28, 21:43, 23:1-37, & Luke 22:28-30. 5 Jeremiah 31:31-37, Ezekiel 37:15-28, Matthew 10:5-7, 15:22-28, 19:28, & Romans 9:1-11:11. 6 Exodus 12:37-38, Luke 2:32, Romans 11:12-32, Ephesians 2:8-18, & Revelation 5:8-10. 7 The name of God and the name of Yeshua are not the vocalizations and symbols by which we reference them in conversation and print, but the nature of who they are. When we call on the name of God, we are calling on his nature as just, merciful, and all powerful. When we believe on the name of Yeshua, we are believing in his ability and sufficiency to save us from the penalty of our sins. 8 Psalms 2:6-7, 53:6, 78:67-70, 110:1-7, 132:10-14, Isaiah 2:2-4, 18:7, Micah 5:2, Revelation 3:12, 21:10-22:5, & etc. 10 Matthew 5:19, 19:17, John 14:15, 14:21, 15:10, & 1 John 2:2-6.